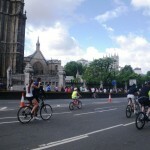 This weekend a large section of central London is closed for a big cycling event. I was too late to register for the 100km race tomorrow, but the free 10km family ride sounded like fun. 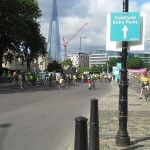 They are expecting around 50,000 riders, making it one of the biggest ever mass bike rides. 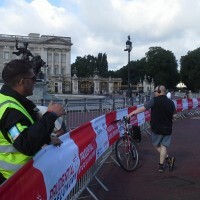 I made the wise decision to leave home soon after 8.00 and after getting only slightly disorientated a couple of times arrived at Buckingham Palace just after the start time of 9AM. I was very glad to have avoided what they expect to be the busy time around the middle of the day, because the course was pretty crowded. 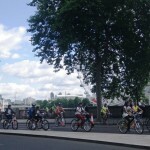 There were riders of every description, from lycra-clad roadies travelling at tremendous speed to small children wobbling dangerously in random directions. There were also quite a few bikes with trailers containing babies, tandems of many varieties and several bikes set up for families of four. There were elderly women on traditional road bikes with wicker baskets, young lads on BMXs, and idiot mountain-bikers like me riding over kerbs and traffic islands, and attempting to jump off the speed bumps. Along the course there were a couple of Caribbean steel bands, some Japanese drummers, and several other bands. When the course passed through a tunnel, signs advised riders to make as much noise as they could. I enjoyed myself very much, and only wish I had brought a NZ flag to fix to my helmet. The first two pics are mine; Felicity went down on the tube to watch, and must have only just missed me, because I overtook the couple on a single bike in her second photo a few hundred metres further along the Embankment.